I’m sorry, guys, but I get really boring in the summer. Like, hey-isn’t-it-nice-when-the-sun-shines boring. Or, let-me-tell-you-about-that-time-I-got-the-apartment-painted boring. Okay fine, I’ll tell you anyway. Remember when I told you that on our Vacation From Parenting I had an ambitious to-do list but my husband was quite certain we’d be better off doing as little as possible? Well, Alex: 1, Deb: 0 and here it is encrypted on the permanent record of the internet. As it turns out, having to take your entire apartment apart to allow for painters is totally not fun at all. Sometimes there’s a communication breakdown that leads to you coming home right as they’re finishing up to find that your apartment had been painted the wrong color. Sometimes, in the same week, your bathtub is suspiciously filled with plaster, your door handle breaks and leaves you locked out of your apartment for an eternity, your air conditioning dies, and 48 hours after the painters had left, not a single piece of furniture got ambitious enough to move itself back into position, which means that you’ll probably be doing that for the remainder of your so-called vacation. Really, Deb [insert slow clap here] next time your husband suggest you do nothing but sleep, socialize and relax for a week, perhaps you might just not argue. It also kills all lofty cooking goals, but since we’re going for honesty, I should just admit that I didn’t have all that many. Like I started saying above before I had to go and prove it, I get a “little” boring in the summer. But, it’s not my fault! It’s just a theory, but I suspect that nature designed summer produce this way, intentionally making it so tomatoes and peppers and cucumbers required exactly zero amounts of cooking to transform them into culinary greatness so that you’d be free for home improvements beach trips and cocktails on decks at sunset. This week’s obsession is, indeed, and conveniently, virtually cooking-free. I’ve always had a soft spot for salads that are almost all crunch and no filler. While the ingredient combinations with which you can play this out are endless, sometimes a specific one gets in your head and you cannot get it out until you recreate it, ad infinitum, at home. This happened this week after we had dinner at The Breslin, before paint and plaster (and the avoidance there-of, which led to oh yes, we did, and I’m not sorry) took over our lives. Pretty much everything April Bloomfield cooks is the kind of perfection that you didn’t know your life was missing before you arrived (hello, lamburger, crisp boiled peanuts and thrice-cooked chips!) but is never going to be complete again without after you left. And yet, it wasn’t as much the market salad as the crazy, absolutely addictive interplay of feta, mint, lime and spectacularly well-toasted sunflower seeds on her chopped salad that I had to have again and again. And so I took this week’s languishing haul from the market and chopped away. I retoasted my sunflower seeds so they’d be darker. I used some queso fresco instead of feta, but you can use whatever you can get, even ricotta salata. I slivered some fresh mint and even stirred in some chile powder and the result has got to be my idea of a summer salad’s highest calling — a revelation, crunchy and refreshing, and leaving you free to be your goofy self. 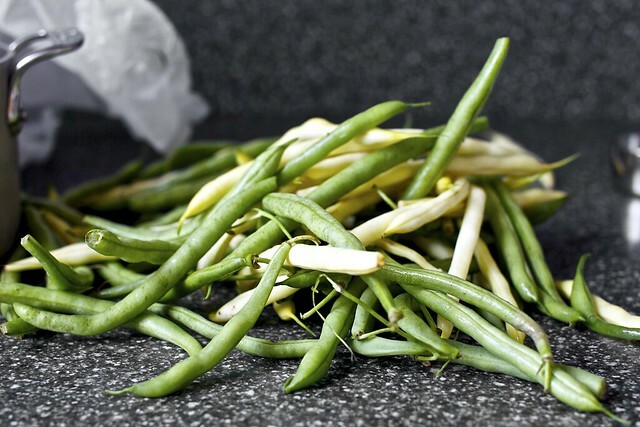 I used 1 cup each of halved and thinly sliced radishes (3 1/4 ounces), 1/2 pound of lightly cooked, cooled green and yellow beans (1/2 pound fresh) that I’d cut into 1/4-inch slices on the bias, and quartered and thinly sliced Kirby cucumbers (from 5 ounces or 2 whole). However, you should use whatever is crunchy and you’re craving, such as peppers, carrots, lightly cooked corn cut off the cob, celery, fennel or more. To bulk this up into a more rounded dish, you could add a cup or two of thinly sliced lettuce, 1 to 2 cups of cooked, cooled grains such as barley, quinoa or farro, or a cup or so of cooked black beans, to add to the Southwestern vibe. In each case, it would be best to double the dressing so you’ll be able to cover everything evenly. 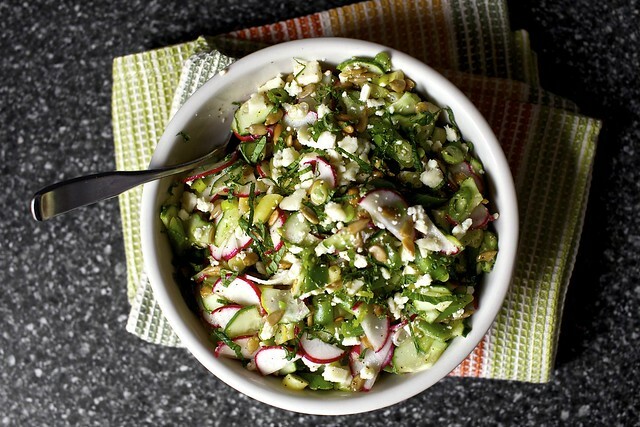 Mix the vegetables, feta, scallions, seeds and mint in a medium bowl. Whisk lime juice, olive oil, salt, spice and black pepper in a small dish and pour over vegetables, tossing to evenly coat. Adjust with more salt or pepper as needed. Garnish with mint and crunch-crunch-crunch away! Sounds like the perfect summer salad! Dinner tonight! You always come through. You made me laugh with this post. I’m sure it was all worth it. Looks delicious and refreshing, perfect for this weather! I have a new mint plant I’ve been trying to find uses for (besides mojitos lol). Can’t wait to try this! perfect for my lunch guests on sunday. I just made your rice noodle salad last night, and this is going on the table the minute my garden beans come in. Well, I don’t find you boring at all and this salad is the perfect summer meal!! Enjoy the weekend. Welp, looks like my nothing-but-recipes-from-Smitten-Kitchen diet won’t be ending any time in the near future, especially when you go posting recipes for which I have all the ingredients sitting in my fridge. This the day after I made your cold rice noodles with peanut-lime chicken for dinner (and just finished eating leftovers for lunch). And there were the broccoli fritters three nights ago. And banana bread this morning. I don’t know how I cooked before you. Perfect summer food always starts with one of your recipes Deb! Can’t wait to try this combination of lovely flavors, thanks! A cup of “barely”, eh? ;) this sounds absolutely amazing!! Thanks for the early morning laughs! So I just made your Mediterranean Pepper Salad last night for a BBQ. All crunch, no filler ;) I’m sure this one’s going to be just as tasty! Nom nom! I feel you on the taking-your-home-apart front; we’re finally past the destruction phase of our kitchen refit (it only took 3 months! ), now to make good and fit a kitchen! This looks great. Hope your weekend is filled with more crunchy, fresh salads and a lot fewer lockouts. I definitely agree that a great big crunchy salad makes a great summer meal! I love your spice suggestions — doesn’t chili powder and cumin go with everything??? I am definitely going to give this a try and I think I will add a little quinoa to make this a meal all on its own! Great recipe! I have been of late taking crunchy chopped salads for lunch everyday. They hold up so much better than a leafy salad . I love the sound of this flavor profile! I love chopped salads – no need for a knife. The perfect lazy-person’s meal! 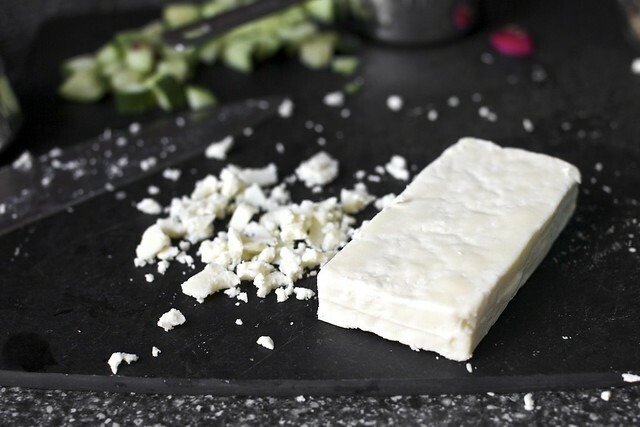 And, really, anything involving a big block of feta is bound to be great. This looks awesome! I love a good chopped salad with lots of herbs. And any salad without feta just isn’t a salad in my opinion :) YUM! There’s nothing better than a refreshing summer salad. Love the slivers of mint and the toasted sunflower seeds! I heard April interviewed this am on the way to work on NPR….and it is posted on their site with her lemon caper dressing. Thanks Deb! Thanks! I’ll be making this for a picnic while I’m at Prairie Home Companion Live tomorrow night. You’re one busy lady! The salad looks delicious! I love simple dishes in the summer time. Less work cooking = more time to enjoy the great weather with friends and family while it lasts! 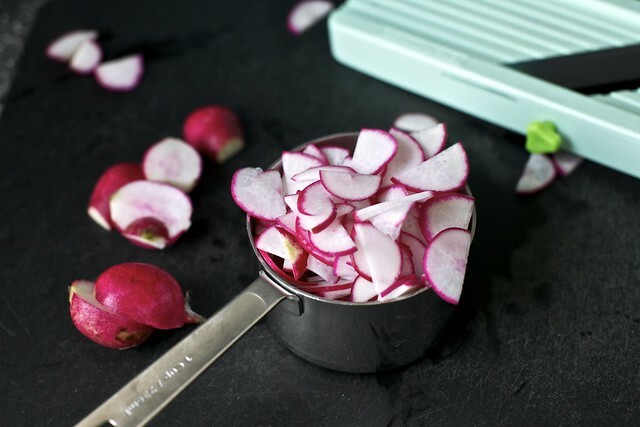 Deb – any recommendations as to the best way to slice radishes thinly? I’m still fairly new to the mandolin (but if that’s the way to go, that’s the way to go!) Do you put like 4 on at a time in the holder-thingy (such a technical term :) )? Or is one the way to go (or for that matter, is knife, best?)? Thanks a bunch!! Sorry, i just had to comment about the movie. My husband thinks it’s got potential, based on the production values he saw in a behind-the-sceens preview, but i can’t get past the ridiculousness of the concept. Every time i see a commercial it just makes me laugh. Not that it matters, since we’d also have to find a few hours away from the kid to do something as exotic as see a movie! Oh my goodness. What an amazing cooking day for you. Not only will I make this salad this weekend. But I will be emailing myself all your recipes from this day from years past and put them on the list as well! This is my kind of summer cooking too. I really enjoyed AL:Vampire Hunter. He’s now my second favorite fictional president! What does happen when your walls end up the wrong color? I’m not sure if I like the salad more or the Pyrex bowl. I don’t have most of the ingredients, but I do have to pick up ingredients on my way home. This might be dinner tonight! Mint and feta? I’m sold. Absolutely adore fresh chopped salads in the summer. Definitely will add this in the rotation. Looks wonderful! Perfect for this hot dry summer we are having. I THOUGHT when you said home improvement you were going to do it yourself; so I had to laugh because you think this is being ambitious. This is now on my to make list. We had thee peanut noodles the other night and yum…love the recipe becuase I am gluten free! But Deb–my new mantra, and it seems like your life could fall into the same category right now is that everything is NOT out of control but rather falling INTO control! I love feta and most of my summer dinners are just tomatoes/cucumber/feta salads…so delicious! Yum – delightful thought for a summer salad. 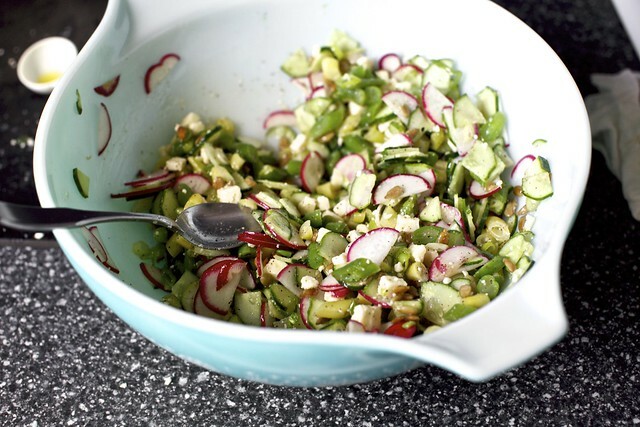 I’ve recently become addicted to radishes and feta together so this is right up my alley! I can’t wait to try this salad, but I’m so worried about your apartment! Did you get it repainted the right color? Don’t leave us hanging! Laceflower — I know, it’s really sad, isn’t it? Apartment — Aw, thanks for your concern. I realize that the above might have sounded like a litany of complaints about my First World Problems; in my head, it was just funny. Anyway! One of the reasons I was dying to get the place repainted is that it’s this dim, dingy, linen, beige-y color that makes everything look sad and dull in a small apartment and I look at it everyday and deeply dislike it. All I wanted was a bright white. I requested it, they went with it, then I came home and …. fresh dim-dingy-linen-beige! I kind of wanted to cry. The painters were amazingly cool about the whole thing and had it done in an extra two hours. Okay, I threw in some cash and a 6-pack of good beer. Whatever, it worked and now the apartment is much brighter, the furniture has been rearranged and everything feels so much bigger and it’s absolutely unhealthy how happy this makes me. Barely = barley — All fixed! Thanks. Radishes — I halved then ran them over the mandoline because I like mine really, really thin. Molly — One calls her husband and asks if he thinks it’s worth it to trouble the painters, and he responds that he thought the color was just (!) fine (!) before so he hardly thinks it’s a problem and then maybe one’s head explodes and decides that if it bothers the one who works from home and sees it every hour of every day, it’s probably worth bothering with. Also, one should probably relax a little, eh? I just made a barely recognizable version for lunch… but it was a whole lot better that what I was planning on. I can’t do citrus, so I tossed my chopped purple cabbage and carrots with yogurt, olive oil & cumin with a squeeze of time and topped them with curried lentil cakes. It was great. I’ll be making a more faithful version for a birthday this weekend (using purple cabbage, for sure). Thank Deb. I don’t know how people have food blogs during the summer. Because I’m like “Hi world? Want to see what I ate today? 3 tomato sandwiches all made the exact same way and a cucumber salad.” If I’m really going big there is some barely cooked corn too. Boring, but delicious. I just need my radishes to be ready to eat so I can make this. I love chopped salads. Your notes on bulking this up made me remember a salad I invented a couple of summers ago — couscous, a crunchy veg or two, diced peaches or other fruit, well-toasted slivered almonds or pumpkin seeds, and mint or parsley or basil or some other herb. With a little lemon juice and sea salt — OMG delish. I made it all the time that summer, and then the winter came, and then I forgot how to make it. Sad. Will have to try it again this summer. this looks so gorgeous. thanks for the inspiration! Perfect looking summer salad and for a second I thought the feta was a block of tofu and thought, oh Deb is up to something new today :) Then I re-read the recipe title…ha! Thank you for this. I’ve been making Greek salad for weeks and it’s time for a change. I get into phases where I just want to eat the same thing over and over until I don’t want to look at it any more. This might be my newest obsession. I just made this for lunch with veggies I had around-zuchinni, broccoli, bok choy – and it was delicious! Looks so yummy!! All you’re recipes look good! Ooh — those radishes look so fresh and bright — like I wish summer actually was behaving in my neck of the woods. Still, maybe if I make this salad, it will come, full of sunshine and warm weather? Maybe. In other news, my friend introduced me to your mango slaw last week and it’s divine — I’ve actually planned a whole meal around it tonight. Thank you for your wonderful summer salads! I have a question but not about this recipe….I am making your pickled coleslaw recipe and just got all the veggies chopped. I stuck my finger in the brine to check temp but also to taste it – is it supposed to taste so very salty? Maybe the magic happens over the 24 hour sitting period? I did use 2 1/2 Tbsp of mortons kosher salt if that makes a difference. I am going to wait a bit to see if I hear from you before combining the two. I have never pickled anything before and I am VERY salt sensitive (I am the weirdo who orders fries no salt) so that could be part of my problem. Sorry to put this in the wrong area but the recipe did not come from your site here. Housework is rewarding when it is finished, but it seems like every time a seemingly “small” thing like painting needs to occur, Murphy’s Law explodes in front of you. Hopefully you got everything put back together so that you can have a relaxing weekend. Your salad looks awesome! I just bought an apple mint plant and have been dying to put it to use. I love everything you put in this salad (emphasis on the feta!) and can’t wait to try it. Wow! This Summer salad looks fresh and so healthy! The mint must give it a delicious taste. And by the way, your pictures are really nice! Thanks for sharing and have a great weekend! This is great, because I was just looking for a non-lettuce-based salad and non-slaw (sorry!) to make tomorrow, and I figured you’d have a couple good options, so clicked over. And right at the top, the perfect recipe for what I want! Deb, just saw you in the Jezebel 25! Congratulations! I am a long-time lurker, but I had to comment on this recipe. I just made it, and it is SO. GOOD. The feta and mint and chile powder and lime… mmmmmm so tasty! Thanks so much! Best salad recipe ever. Lovely! It screams summer and I love all the fresh ingredients! I just made this, and am eating a bowl of it right now. It’s amazing! So much more than a sum of its parts. The toasted sunflower seeds give it an almost popcorn-like addictiveness. Great job, Deb! Deb, you’re on Jezebel!? http://jezebel.com/5921504/the-jezebel-25-fancy-group-portrait-edition/gallery/4 Look beautiful! Benjamin Moore Bright White. The secret paint for all modern interior designers and architects. Worth whatever it takes to get the walls painted right. What could be regrettable about watching one of our greatest presidents save the union from collapse by fighting undead southern gentlemen? Nothing, that’s what. Deb, it still says “such as barely,” at 8:41 on a beautiful beautiful Saturday morning. The crunchy, flavorful salad in this post is just exactly what I love to eat all summer long! And you know, everything looks better with a fresh coat of paint — hope all the glitches are now things of the past and you can enjoy your “new” home. too funny! my daughter was just gone for a week and I guiltily had a friend visit and went for walks and drank wine and hung out for a few days. the description of your week wipes out my guilt and makes me glad I did instead of cleaning out the garage and straightening out my pantry. Thanks! Amanda, please, can we keep politics out of our salad experience! If you were using asparagus in this, would you blanch it first? to Sarah B – raw asparagus is delicious, would be perfect in this salad. But I really want to say that I am logging on to this conversation simply because I was delighted with Amanda’s comment of June 29 and wanted to say so! AMEN and, you GO, Girl! Love these types of salads! Lately have been obsessively making something similar but with chick-peas, israeli couscous, lemon, basil, cumin–among other things. Will try the lime/mint/feta combo, sounds great! Deb, can’t wait to try the salad. My DH, who avoids cucumbers, will just have to nuke a hot dog, or something. And, you have my mixing bowls! You have “heritage” Pyrex mixing bowls, like the set I used to use, that was probably a wedding gift 45 years ago! Oh my goodness. Deborah — You’re right! I just went to check it and (boringtechblahblah) it told me I had an unsaved change lingering and for whatever reason, the edit didn’t save. NOW it should be fixed. And thank you. Helen — Thanks. That was my mom’s bowl and she was going to get rid of it (my parents don’t have an iota of nostalgia/packrat in them… please don’t get me started on the 100 year old piano they want to cast off) so I stole it. It’s light and wonderful and holds a lot. My parents were married in 1968 so entirely possible it was a gift. Natalie — Thank you. There was an hour of hair styling and make-up (so heavy and dramatic I was forced to reconsider everything I once knew about make-up and buy new stuff) and then 30 minutes of all sorts of good photo mojo from Nikolai. I.e. Not your average realistic snapshot! I made this last night and it turned out fantastic. I have never bought radishes before, and I can’t believe how cheap they are! I added some honey to cut the acid, and it tasted like I was eating a crunchy mojito! So good, Deb. Thank you. I picked up some feta today, I shall have to try this now. Looks like such a lovely recipe. I love the colours of this dish! Reminds me of a Nigel Slater salad that I made this week using radishes, feta and mint. I served it with baked salmon. Yum! Same thing happened to me with painters last year–wrong color! Actually, they knew my color but instead of color-matching, found one “they thought” was close enough. Total disaster! Salad sounds great. I’m going to make it with leftover green beans. Absolutely delicious salad. I used radish, cucumber, feta, raw slivered beets. I never use kirby cucumbers. It is great knowing they can be used for other things than canning (which I am waaaaay too lazy to do). Thanks! One day at Whole Foods I asked a fellow tending the produce if the tops of radishes were edible, and he said that they were. I bought 2 different kinds and used them, tops and bottoms, as the base of a salad. Since then I’ve come up with many combinations but always use the radish as the base. With the radish base my favorite mix is tomato, cucumbers, corn, scallions, black-eyed peas, mint, bell pepper (a mix of red, yellow & green), golden raisins, feta, a hand full of mixed baby greens and walnuts. I dress it with a classic vinaigrette that has a touch of honey in it. Paired with a nice crusty bread, a glass of wine and I can deal with Atlanta’s 104 degrees just fine. This is beautiful. I’d love to see more recipes like this! Thanks for the fabulous idea- love the veggies! This looks delicious and it’s just what I need right now. Who wants to stand over a hot stove in the middle of the summer? i love a big fat fancy summer salad. this looks great! Made tonight – delicious! I used heirloom carrots (red & yellow! julienned), kohlrabi (julienned – my “new” veggie – just tried it from CSA last week; perfect in this salad), green/yellow beans, and a little regular cucumber. Loved the flavor the toasted sunflowers added. I love love love salads like this during summer! Sadly, it’s winter where I am, so although I continue to eat salads, it just doesn’t feel the same. What mandolin do you use? I’ve been wanting to buy one but get confused at which one is best! Made it and loved it! I added more cayenne (maybe a quarter tsp–and love it), more feta (about 1/4 cup more, and regretted it! Overwhelmed the dish) and 2 cups of wild rice (and doubled the dressing). Overall, wonderful and will make again…with less feta. Thank you for rocking, Deb! Made it, loved it!! Used toasted pepitas and a nice, sheepy feta. Sweet red peppers, zucchini, daikon radish. This will be a versatile go-to for me because the acidity/oil balance is right where I personally like it. Thanks so much, Deb! Just made this! to die for!!!! I added broccoli slaw (chopped a bit finer), and a can of water chestnuts (diced fine) in addition to the green beans, scallions, cucumber and radishes, and cumin & red pepper flakes to the dressing. I too, toasted the sunflower seeds (salted) to a rich dark roast. This salad is delicious right after being tossed…No need to set in the fridge for hours…Thank you, thank you!!! I love the idea of using crunchy veggies of choice…it means this recipe can have endless variations: BRILLIANT! This will be perfect for dinner this week, especially since NYC is basically melting as I type. And April Bloomfield inspired? Even better- everything the woman touches (or inspires) get a huge stamp of approval from me! Now I know what to do with that jicama the size of my head. This is my 1st visit to your blog and I’m having fun looking around! I LOVE chopped salads, and for assorted reasons, I think my favorite was mentioned above – they take less energy to eat! LOL!!! I WON’T go down the home renovation path, we’ve been renovating since we got married . . . 19 years ago! I HATE salad…but this…this is good. Really really good. I love that it’s versatile…I don’t love onions, so I threw in some chives from the garden instead..and I used sugar snap peas instead of the green and yellow beans. Nothing against green and yellow beans, I was just feeling the sugar snap peas. I made it this past (HOT) weekend in the middle of tackling my to-do list. Very satisfying, even though I had to convince myself that salad is a much better lunch than ice cream. Thanks for yet another great recipe!! This will fit into my cooking regimen when kids are at camp (6 wks). Their father writes them saying I quit cooking and only make bread, cheese and salad. Perfect! I made this last night with fresh corn, radish, and zucchini, and my husband said it was one of his favorite meals I’d ever made. Thank you, as always! That looks like exactly what I want in this weather. Perfect! An amazing find! I just made it for dinner to accompany my pumpkin soup, simply divine! You have an amazing imagination Deb! I love this salad and have made it twice already! I added cooked edamame and Israeli cous cous (or whole wheat orzo) to make it more of a complete meal. So delicious! another spoon salad!!! I LOVE LOVE it, and I am dying to eat some radishes in a big delicious salad! Just made this salad using green beans, cucumber, and roasted golden beets. I also threw in a couple spinach and feta chicken sausages (thank you, Whole Foods!) for some staying power. SO delicious. Made this last night for my Mother-in-law who is usually a very light eater… She had seconds! and my honey who usually finishes up the salad let his Mom have the last bite! Needless to say I will be making this again and again! Thanks for another great salad recipe! Wow. I. Love. This. Just ate it last night and it’s anything but boring! 2. Hubster and I have similar conversations, though they usually happen on a daily basis when I list the things I want to do in an evening. You know, things like, make dinner, workout, shower, edit pictures for a blog and clean the entire condo. Totally doable in 4 hours, right??? 3. I have that set of Pyrex mixing bowls and I’m pretty much in love. Do you have whole set? I made this yesterday using an english cucumber, red bell peppers, carrots, green onions, and garbonzo beans. Delish! Thanks again for another terrific recipe. I relate to your pain about the painting … painting a home (of any size, whether you or someone else is doing it) must be some particularly special form of tribulation. We are there right now. I never comment but have loved your blog since the beginning. Thanks, Deb! How perfect! I am trying not to turn on my oven this week since NYC is almost at its boiling point. This looks so refreshing! This is so good. I am kicking myself for forgetting the chile powder when I made it tonight (with romaine/peppers/carrots/pepitas), but I will most certainly remember to add it tomorrow. And they day after. Because I am going to be eating this salad over and over this summer. You are right that the flavor combination is addictive! I really really really wanted to love this one as much as I’ve loved all the recipes you have shared that made my taste buds sing, but alas, it was not to be. Not sure if it was texture, or the dressing, but it didn’t work. I may try it another day with some change ups? In the meantime, I will continue to enjoy all of the other dishes I have culled from my favorite food blogger!! The chopped salad with feta, lime, and mint is amazing!!! Goes great with lamb chops and mint jelly! Thank you! My meal was a hit!!!! Just made this for dinner – what a great summer salad. Used radishes, beans, cucumber and beans. Was out of mint, so gave it some good ol’ basil. Realize it’s a completely different taste, but it worked well. We’ll be looking forward to trying it with mint, once it grows back. This sounds really different…can’t wait to try. As soon as I saw this recipe, my mouth hankered for a young Macabeo. 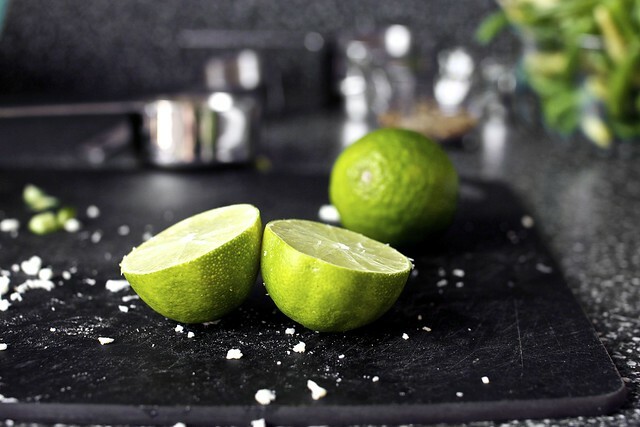 Perfect lime characters that will match the mint. I made a similar dressing a couple weeks ago, minus the chili powder. I put it on chickpeas, cucumber, avocado, red onion and mint and called it Mediterranean-Mexican salad. I’m trying this veggie combo now. My sister came in from New York last night to visit and I made this for dinner. It was a huge hit and even better for lunch today! This was just too delicious. Not sure if anyone else in the family liked it as much as I did, and it was even tasty the next day, when it was a little soggy. Btw, I used dried mint (fresh was all sold out), and substituted pumpkin seeds for sunflower seeds. I even sliced the radishes really thinly in my food processor. Very, very good. Despite the fact that it is so cold here I’ve had to get out the ugg boots to keep my toes warm, I was compelled to make this because it looked so good…and have had it three times since – using whatever herbs I had including coriander and thai basil. And still I want MORE. This is what I call a colourful, extravagant and re-freshing salad! Your photos tells a story and are impeccable. Great Job! Now I know what I’ll make on Friday when I have to take a salad to someone’s house for dinner. I would recommend eating this salad within an hour or two of making it. I made the mistake of making it last night for lunch at work today, and it’s not the most appetizing thing–the radishes turned everything a pink color, the green beans became mushy, and everything just tastes old and not fresh. Oh well, lesson learned. On the bright side, it looked great last night! Sounds and looks amazing! Definitely making this! Obsessed with this salad! I’ve been making a version of it at least three times a week since I read this post. It’s so great for summer when you don’t want to cook anything. I just made this tonight after thinking about it ever since you posted it. It was absolutely delicious! Thank you :) My husband loved it as well, and it made a great meal for 2! I have now made this for the second time. The first I followed the recipe to the T. Tonight I tried my own variation: purple cabbage, cucumber, red onion, mint, feta, romaine, tomato, avocado- no dressing. Just lemon and alot of fresh pepper. The avocado acts as a dressing and I am from California so I always have them on hand and you get to a point where if you don’t use them they will go bad… That being said- between the mint, the red onion, and the lack of other flavors clouding this salad- my taste buds scream fresh and flavorful- and they are smiling! Thanks for the great idea. I used to shun mint- now I am obsessed. Finally a use for sumac! Have made this salad about 3 times since you posted it – love it!! And everyone I serve it to raves about it. What a great combo of flavors! This is my new favorite salad. I have made it 4 times already! Delicious! One of the best chopped salads ever. Ok, I know I commented above months ago but I just had to come back to tell you one more time how this salad has improved my life. I’ve been making it all summer and, let’s be honest, have no intention of stopping in deference to any seasonal change. It’s. So. Good. Thank you! I had printed this recipe last year, and FINALLY got around to making it tonight. This rocked my world! The best salad I have had in ages! I needed to use up some CSA cucumber, which I don’t even like all that much. Just that and green beans, and this was spectacular! One of those “greater than the sum of its parts” deals. made this tonight — preceded by oysters (lemon only) and served with prawns… divine. Very shmick for a mid-week dinner! Christmas dinner, right here. green beans, red bell pepper, jicama, daikon radish, avocado, hardboiled eggs, + feta, mint, cilantro, and the lime juice dressing. Not classic, but very tasty. I made this last night with jicama and avocado also! Such good additions. I used zaatar which added a delicious tangy favour. I love how versatile this recipie is! This has been on my list of must-makes but finally happened the other night. Fantastic!! Used Kirby cucumbers, a mix of regular and French breakfast radishes, and some 2-minute-blanched green beans, along with ricotta salata. Yum!! Will be in the regular rotation, particularly during these muggy Brooklyn months! 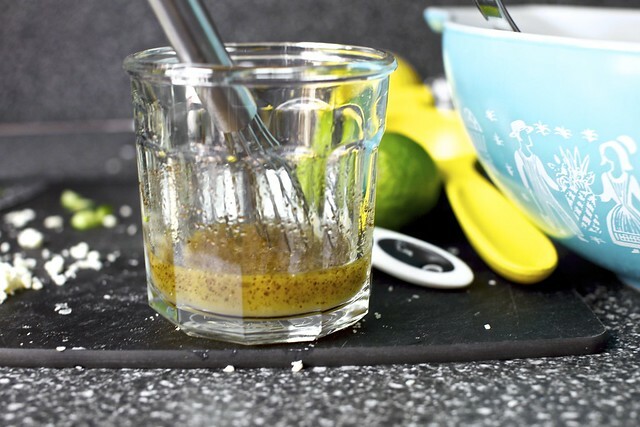 I’ve been making this dressing as part of a go-to salad for years. It’s easy to make – roasted sweet potatoes, corn, black beans, thinly sliced red pepper and cilantro/feta. Yum, yum, yum! I have just made (and am eating right now in Melbourne, Australia) this delicious salad. I used green beans, radishes, raw sweet corn, carrot and cabbage, and bulked it out with couscous. I used cayenne pepper, sumac and cumin in the dressing. Delicious! The only problem with this salad is that I have just eaten it all in one afternoon. By myself. Made this with cucumber, celery and yellow pepper. Used chilli powder, cumin and sumac in the dressing. So, so yum … will definitely make it again. Do you cut the beans into tiny slices before or after lightly cooking them? Lauren — I do it after because I find it easier (and less soggy). I made this with cabbage instead of green beans because that’s what I had from my CSA. I used ras el hanout and doubled the feta. It’s delicious! So crunchy and refreshing. Thank you. Made with carrots, cucumber and red pepper. Just perfect. Wow wow WOW deb what a functional delicious salad. I made 1.5 batch for 4 people last night and 12 hrs later there is none left. Used half a bulb of fennel, green beans, a little corn, 4 kirby cucumbers, peppers, and with israeli feta (a lil creamier)… and cumin and Tajin seasoning in my dressing. we all crunch crunch crunched away quite happily. thank you for your immaculate taste (in every sense of the word)! Found this on the smittenkitchen instagram and made a double batch for a few workweek lunches – it was wonderful! The scallions, mint and lime make it smell heavenly, and the crunchy textures are great. I made it with 2 cups each of radish, raw snap peas, and kirby cucumbers. Added a can of (drained) black beans. Forgot the pumpkin seeds. Still great! Adding this to my summer rotation! Excellent salad! My dressing was too sour/bitter, so taste before mixing it in. (Maybe my lime was extra strong?) I put some extra olive oil and added 1tsp sugar and it was perfect. Just made this! Great combination. I added 1 tbsp agave to the vinaigrette and it really helped to bring forward the flavor of the fresh mint. Perfect timing! We have leftover mint (thanks Kentucky Derby) and our farm fresh co op includes lettuce, radishes, and scallions this week. I LOVED this. Made is as is with recommended veggies – worked well to double it. It was great the next day as well, but too mushy after that. Love this salad – made it twice this week! I used mini-cucumbers, radishes, corn kernels, edamame, and carrots. It sure goes fast!